As feds anticipate an official White House announcement on the 2018 civilian pay raise, perhaps it is time to look back on pay boosts through the years for both military and civilian federal employees. President Trump has yet to officially announce a civilian pay raise for 2018, though he authorized a 1.9 percent increase in August. This figure includes a 1.4 percent base increase, and an average 0.5 percent hike in locality pay. The military, however, appears headed for a bigger boost. Lawmakers increased Trump's proposed 2.1 percent military pay raise to 2.4 percent when passing the fiscal 2018 National Defense Authorization Act in November. Earlier this month, a group of 12 House lawmakers from both parties sent a letter to Trump asking him to grant civilian employees a 2018 pay raise equal to what the military receives. 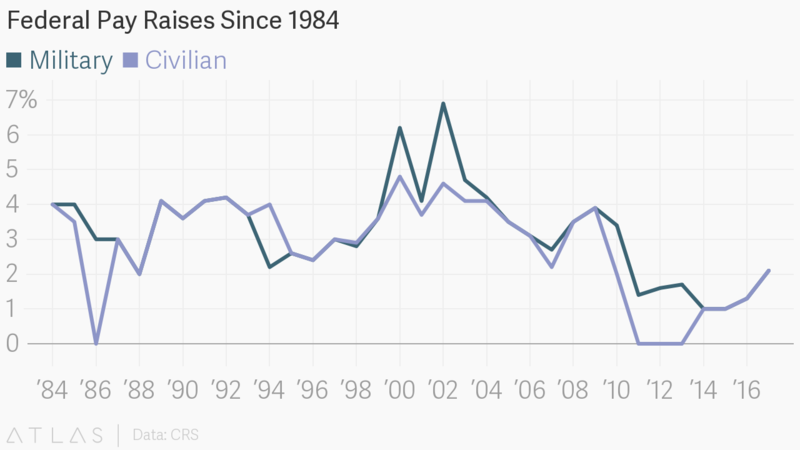 Using Congressional Research Service data, GovExec has compiled the military and civilian pay raises since 1984. Congress has frequently granted larger annual salary bumps to the military in recent years, reversing the trend of the late 1980s and 1990s of military and civilian pay raises mirroring each other. In 2011-2013, civilian federal employees received no pay raise at all. Check out the pay raise trends in the chart below.